"To cherish the life of the world..."
1 "To cherish the life of the world..."
Margaret Mead "To cherish the life of the world..."
3 Her most famous work is Coming of Age in Samoa (1928)on "the psychological attitude of the individual under the pressure of the general pattern of culture" to relate Samoan adolescents to those of the United States. 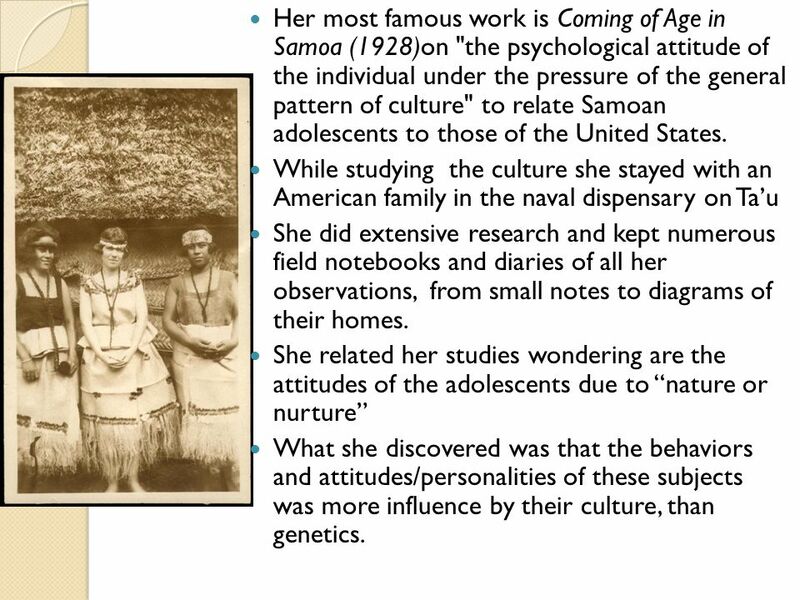 While studying the culture she stayed with an American family in the naval dispensary on Ta’u She did extensive research and kept numerous field notebooks and diaries of all her observations, from small notes to diagrams of their homes. She related her studies wondering are the attitudes of the adolescents due to “nature or nurture” What she discovered was that the behaviors and attitudes/personalities of these subjects was more influence by their culture, than genetics. 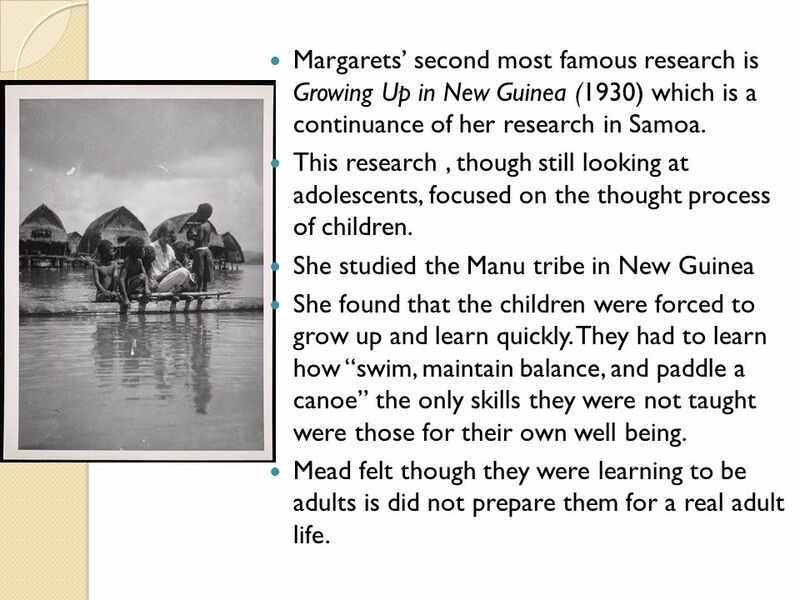 4 Margarets’ second most famous research is Growing Up in New Guinea (1930) which is a continuance of her research in Samoa. This research , though still looking at adolescents, focused on the thought process of children. She studied the Manu tribe in New Guinea She found that the children were forced to grow up and learn quickly. They had to learn how “swim, maintain balance, and paddle a canoe” the only skills they were not taught were those for their own well being. Mead felt though they were learning to be adults is did not prepare them for a real adult life. 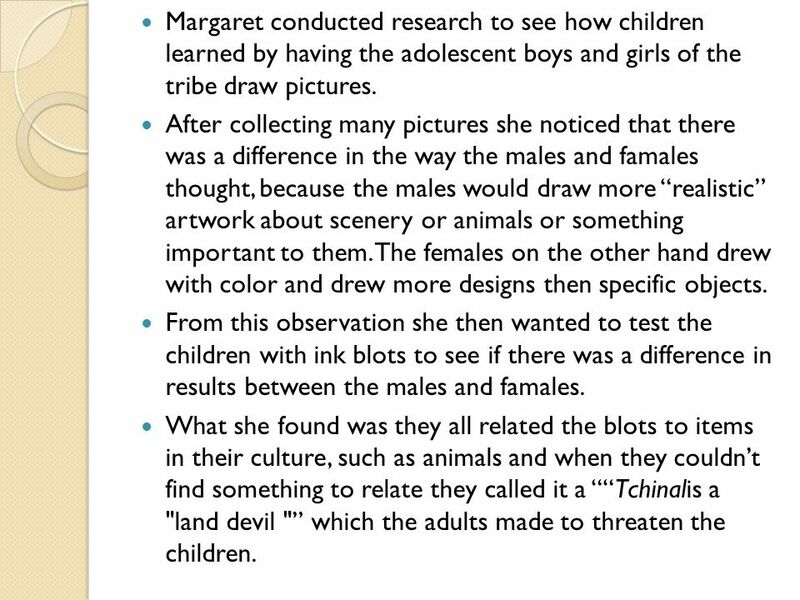 5 Margaret conducted research to see how children learned by having the adolescent boys and girls of the tribe draw pictures. After collecting many pictures she noticed that there was a difference in the way the males and famales thought, because the males would draw more “realistic” artwork about scenery or animals or something important to them. The females on the other hand drew with color and drew more designs then specific objects. From this observation she then wanted to test the children with ink blots to see if there was a difference in results between the males and famales. What she found was they all related the blots to items in their culture, such as animals and when they couldn’t find something to relate they called it a ““Tchinalis a "land devil "” which the adults made to threaten the children. 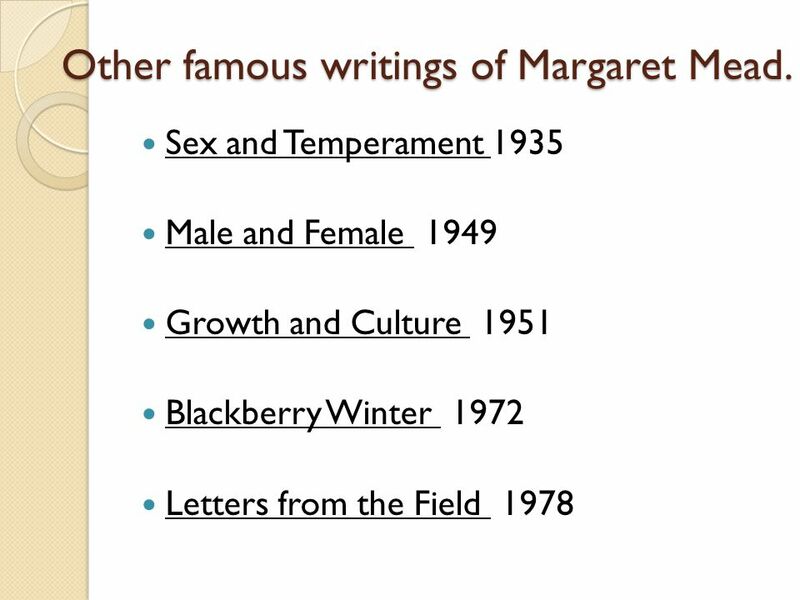 6 Other famous writings of Margaret Mead. Download ppt ""To cherish the life of the world...""
Georgia O'Keeffe [American Painter, ]. What is the main idea (focus) of this painting? A Flower What style of art do you think this is? Abstract. Gender and Sexuality Dr Rhoda Wilkie SO 1004. Kindred Octavia Butler. June 22, 1947-Feb. 24, 2006 Dyslexic Born in CA Wrote Kindred in response to reading a bad sci-fi movie, Devil Girl from Mars. + Human Growth and Development FYI Human Growth and Development (HGD) Provides foundational knowledge about lifespan development One of the corner. Explain Cultural Variations in Gender Roles Patrick Bradley IB Psychology HL.  Borne in New York  Fascinated with death after her father died  Received her first degree in English Literature at Vassar College.  Received her. 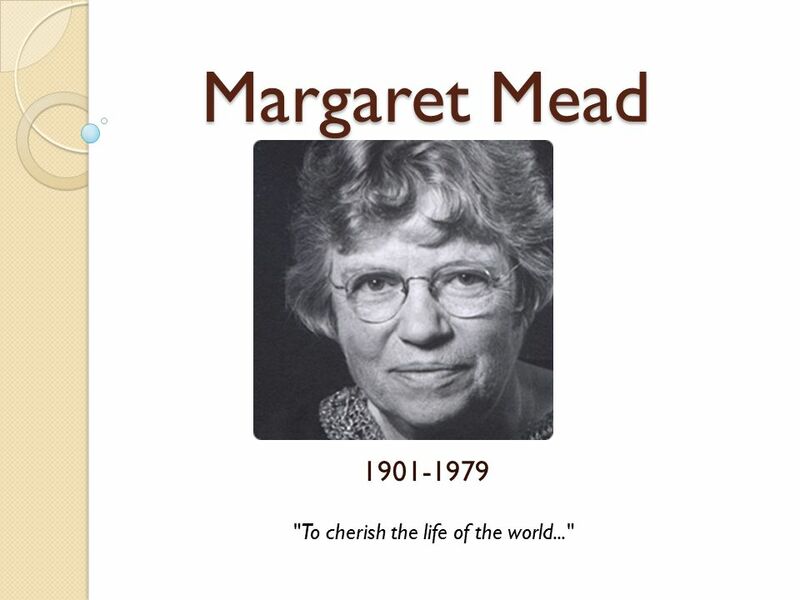 Margaret Mead (Dec. 16, 1901-Nov. 15, 1978) An American cultural anthropologist and speaker in the mass media throughout the 60's and 70's Born to a professor. 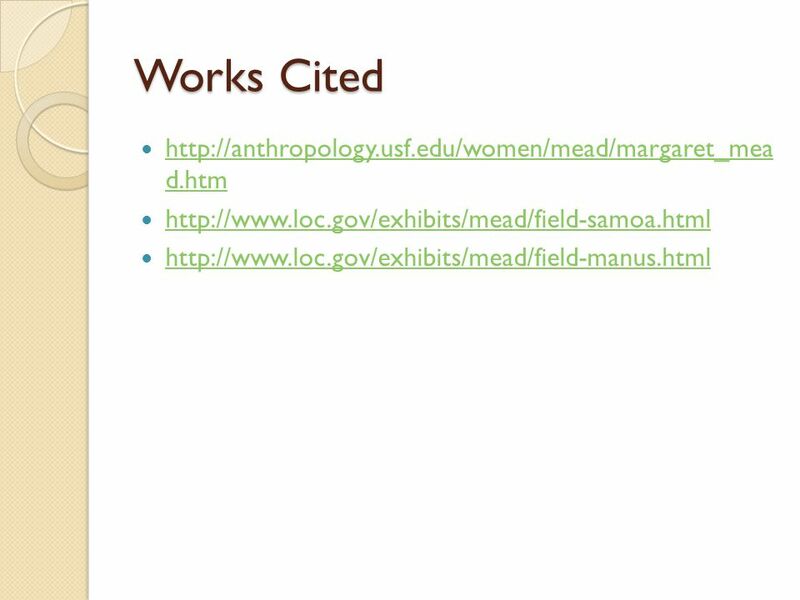 What is Anthropology? 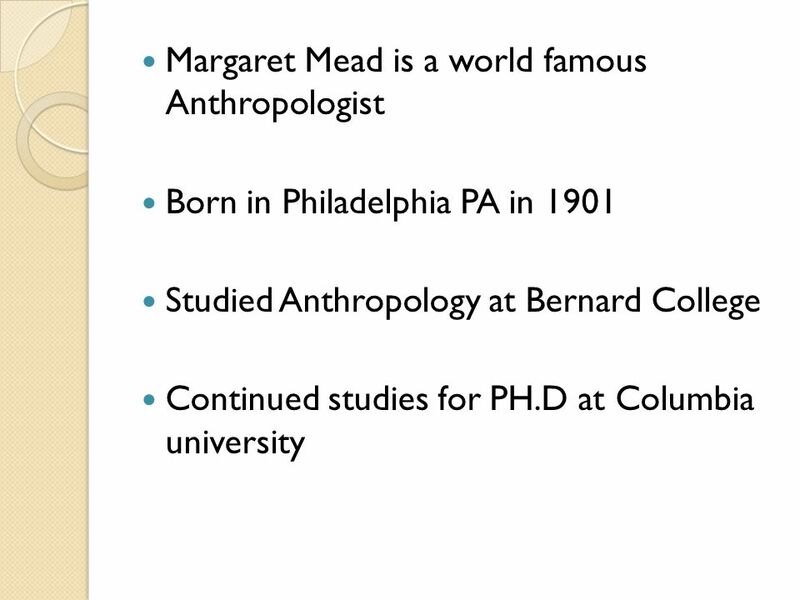 Anthropology is the broad study of humankind around the world and throughout time. It is concerned with both the biological and. Children Witnessing Domestic Violence HED 487B Emily Groben. R ELATIONSHIPS AND S EXUALITY E DUCATION (RSE) Parent/Guardian Information Evening RSE Training Support Service for Schools Drumcondra Education Centre. Objectives: List the major theories of personality theory.  Who cleans the house?  Who provides for the family?  Who makes the first move in a relationship?  Who takes longer to get ready? Gender Differences and Theories How do we acquire our sense of male and female behavior?  Chapter 3 Section 2 and 3 Notes.  Jean Piaget o Focused on the development of thought o As the child grows, intelligence and the ability to understand. Artistic Development “The teacher who knows the difference between adult and child world views is likely to communicate and educate more successfully than. Outcome(s)  Assess the extent to which biological, cognitive, and sociocultural factors influence development  Evaluate psychological research relevant.